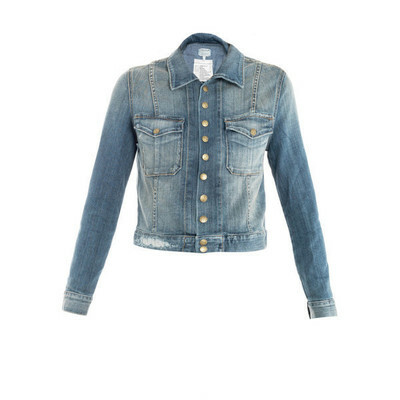 This mid-wash denim jacket has a point collar, a buttoned centre-front fastening and long sleeves with button fastening cuffs. The jacket has a light fading and distressed detail with two flapped front pockets. Designer wash: Juke box. 90% cotton, 6% polyester, 4% elastane. Machine wash. Country of origin: USA. Size and fit: Model is 5ft 9in/ 1.80m, is a UK 08 and wears a size 1. Fits true to size. Shoulder to hem 19in/49cm. Bust 37in/94.5cm. Waist 35in/89.5cm. Sleeve length 23in/59cm.